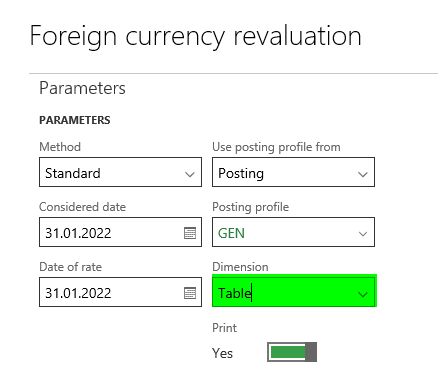 This post deals with the foreign currency revaluation feature available in the Accounts Payable (AP) module and illustrates the effect that different parameter settings have on the foreign currency revaluation calculation and ledger posting. Please note that the examples and explanations made in the following do also apply for the Accounts Receivable (AR) module as the foreign currency revaluation functionality in AR is basically identical to the one in AP. The post is separated into four parts. The first part starts with an analysis of the different currency revaluation methods. This part is followed by a subsection on the different financial dimension options available for foreign currency revaluation postings. 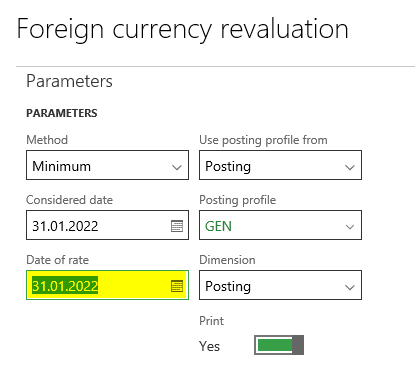 Part 3 deals with the posting profile parameters and part 4 concludes this post by having a look at the different dates that can be selected when running the foreign currency revaluation process. 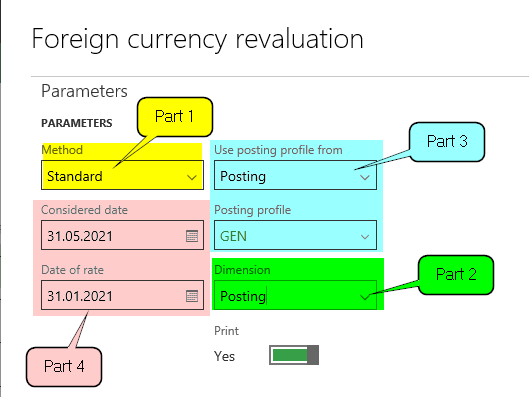 Let’s start by having a look at the different currency revaluation methods (standard, invoice date and minimum) that can be selected in the foreign currency revaluation parameters form. For that purpose a vendor invoice with a total amount of 1000 USD has been recorded on 1 January when the exchange rate between the USD and EUR stood at 1,00. The first currency revaluation is run on 28 January with the “Standard” method. Because of the appreciation of the USD, an unrealized foreign currency loss of 250 EUR arises that is shown in the following revaluation report. The unrealized loss is posted on the account for unrealized currency losses and increases the vendor liability expressed in EUR currency correspondingly. 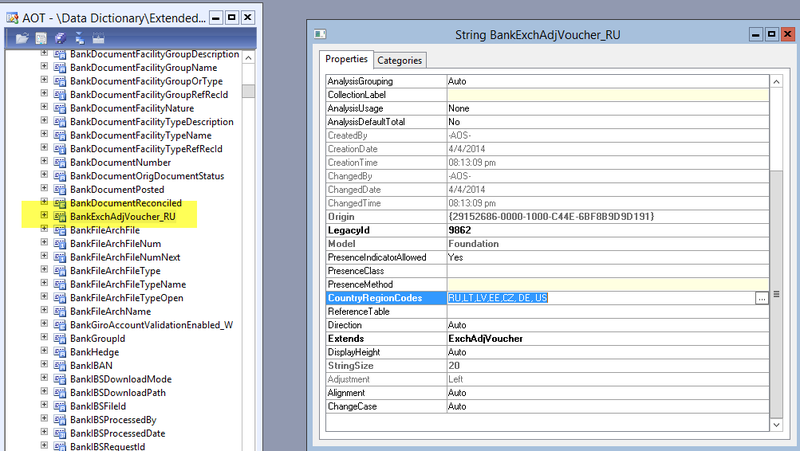 Next, a foreign currency revaluation with the „Invoice date” method is run. Please note that selecting this method does not allow you changing the date value shown in the “Date of rate” field. As the “Considered date” value can be changed, I entered 31 January to identify the effect that this change might have on the transactions generated. The third foreign currency revaluation is run with the “Minimum” method. This time, the considered date and date of rate values are set to 31 January. 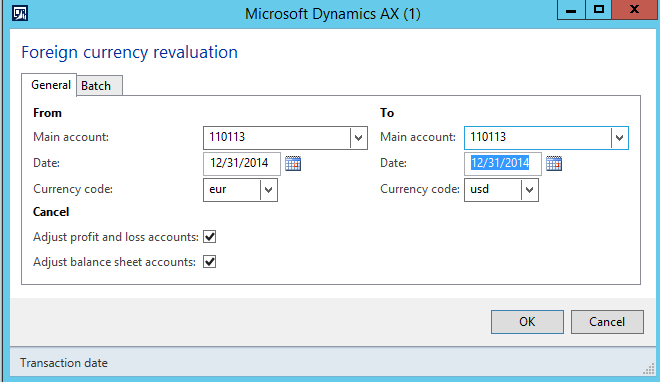 This time, Dynamics AX does not record any foreign currency revaluation adjustment and does not create a voucher. 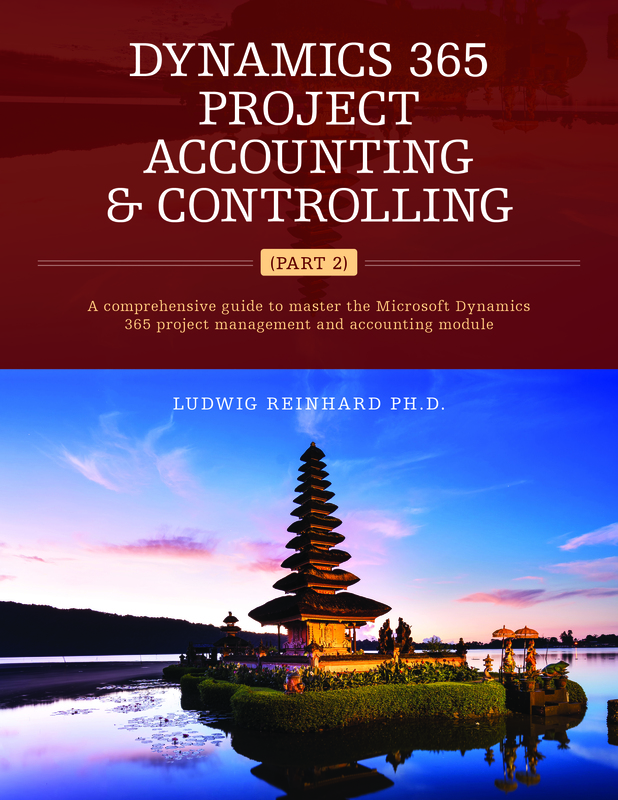 That is because the “Minimum” method does not record a foreign currency gain as it would result in an unrealized exchange rate profit that some countries – such as Germany – do not allow to report in corporate financial statements. 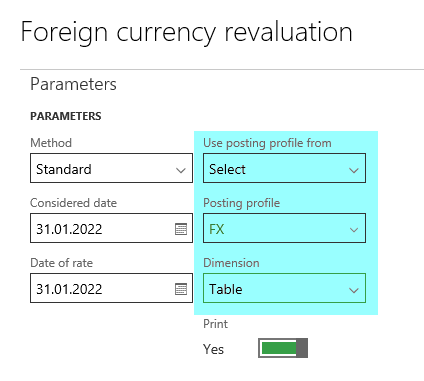 After having a look at the different method options available for foreign currency revaluations, the financial dimensions parameter is investigated next. To do that, let’s first have a look again at the invoice voucher that has been recorded on 1 January. The invoice voucher illustrated in the previous screen-print shows that the vendor invoice is recorded with the financial dimension “Business Unit 002”. 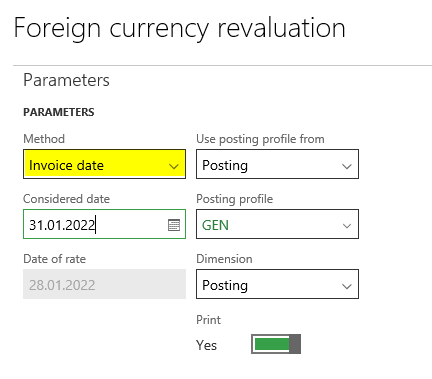 Against the background of the invoice voucher generated, let’s have a look at the foreign currency revaluation voucher that is generated when “None” is selected in the dimensions parameter field. As one might expect, the foreign currency revaluation adjustment is recorded without any financial dimension value. 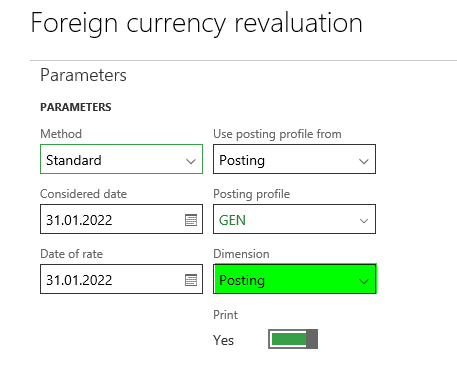 To identify what difference the selection of any other dimension parameter makes, the previous foreign currency revaluation is first reversed by using the invoice date method shown above and then run again by selecting “Posting” in the dimension parameter field. Please see the following screen-print for details. 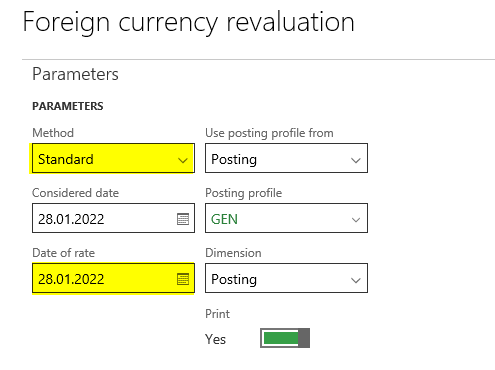 This time, the foreign currency revaluation voucher is generated with the financial dimension that has been used for posting the vendor invoice. 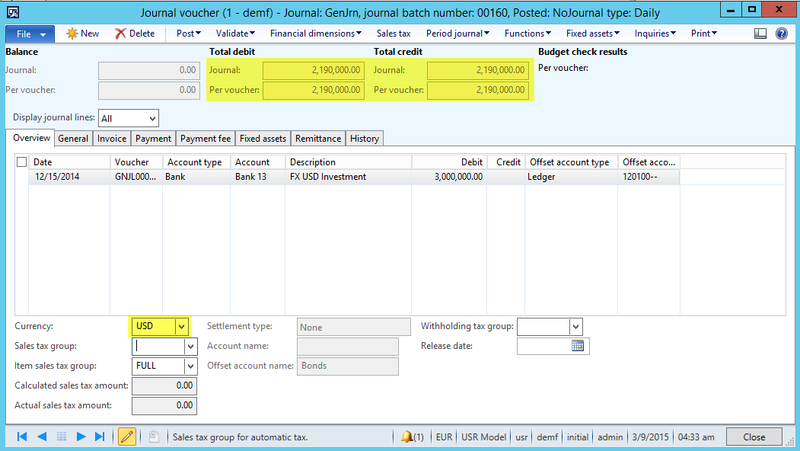 This time, the foreign currency adjustment voucher is generated with the financial dimension “Business Unit 001”. Please note that the financial dimension value “Business Unit 001” is taken from the vendor master record as exemplified in the next screen-print. Please note that the “FX” posting profile is setup with a different summary account. 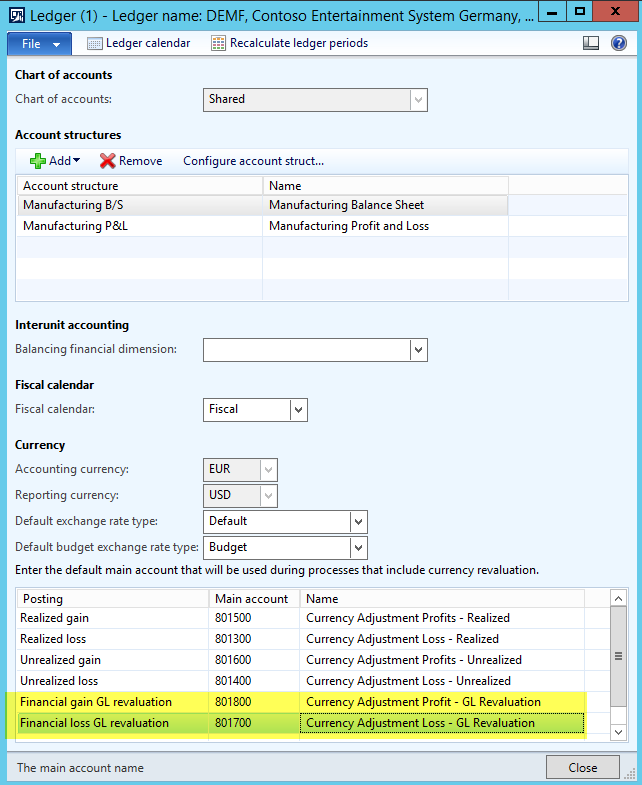 Different from what one would expect from the parameter settings shown above, the foreign currency adjustment voucher still uses the same vendor summary account (No. 200100) for recording the unrealized foreign currency gain. Please see the next screen-print. The underlying reason for this behavior is that the dimension setting “Posting” overwrites the posting profile parameter setting. 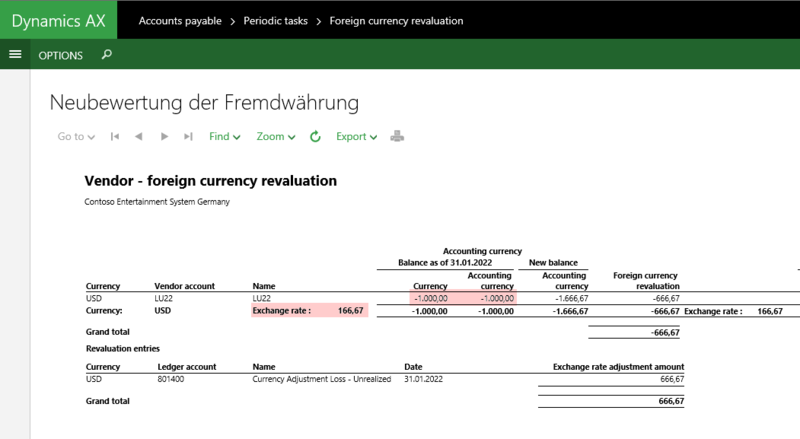 In order to verify this system behavior, the previous foreign currency revaluation is reversed (by using the Invoice date method) and re-run with “Table” selected in the financial dimensions field. 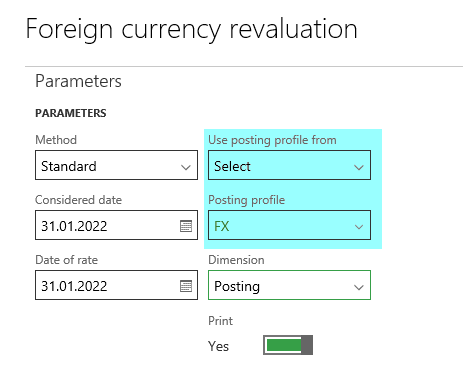 This time, the unrealized foreign currency revaluation gain is recorded on the summary account that has been specified in the “FX” posting profile. 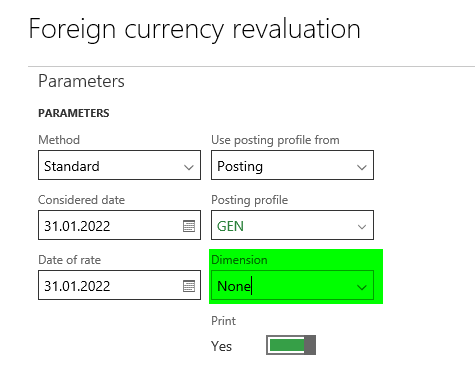 Using a separate posting profile for recording unrealized foreign currency profits can help companies in two ways. First, through an easy identification of a company’s foreign currency exposure and the related risks. 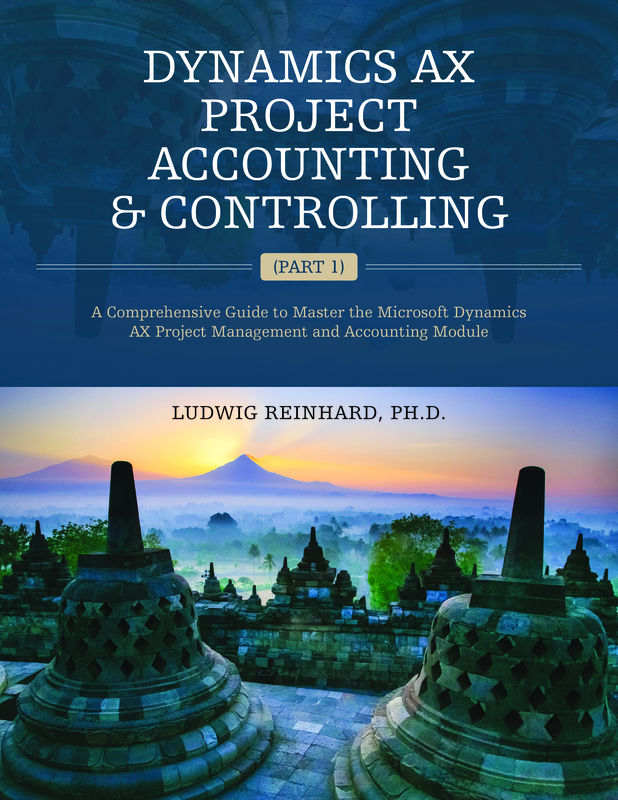 That is, while the unrealized foreign currency gain/loss accounts do not differentiate between group internal and external currency risks, the use of a separate posting profile with vendor/customer group specific summary accounts for foreign currency adjustments, can help companies assessing whether or not the use of foreign currency hedging instruments might be beneficial. The consideration behind this statement is that only risks from external currency fluctuations should be hedged while group internal currency risks do not require costly hedging instruments. Second, the separation of currency revaluation effects on separate ledger accounts can alleviate the financial consolidation process. After reversing the previous foreign currency revaluation once again, a second vendor invoice for 2000 USD is recorded on 1st February. On this date, the USD/EUR exchange rate stood at 1,00. For details, please see the next screen-prints. Dynamics AX generates a foreign currency adjustment based on the exchange rate valid on 28 February (0,6 EUR/USD or 1,6667 USD/EUR). Because the considered date (31 January) is before the date the second vendor invoice was posted (1 February), only the unrealized foreign exchange rate gain for the first invoice is taken into consideration. 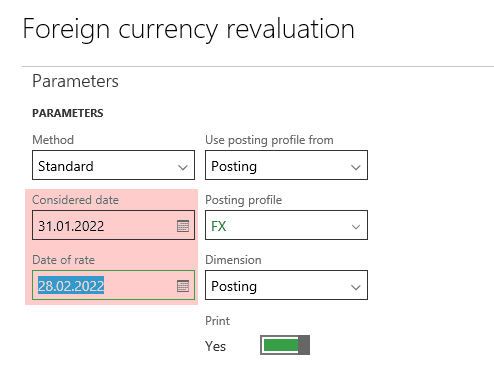 After reversing the previous foreign currency revaluation, the revaluation process is re-run with a considered date value that is after the date on which the second vendor invoice was recorded. This time, both invoices are included in the foreign currency revaluation process for recording the unrealized foreign exchange rate gain. Hope you found some useful information in this post. Till next time. 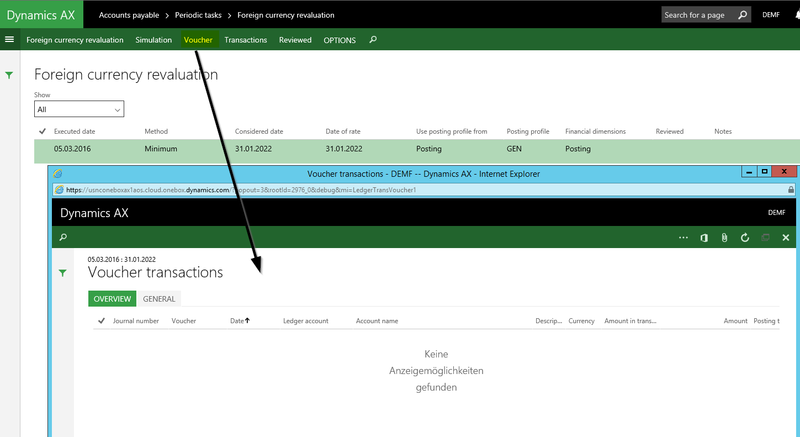 If you record foreign currency transactions you might experience a situation in which Dynamics AX records foreign currency gains/losses on the wrong ledger account. This blog post illustrates the circumstances under which you might run into this situation and provides you a possibility how to fix this issue. 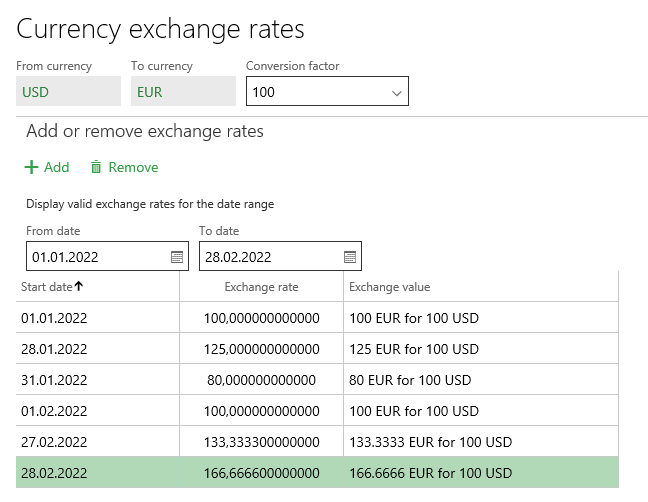 For this example, the following (fictional) currency exchange rates between the EUR and USD are used. (Please note that the local company currency is EUR). 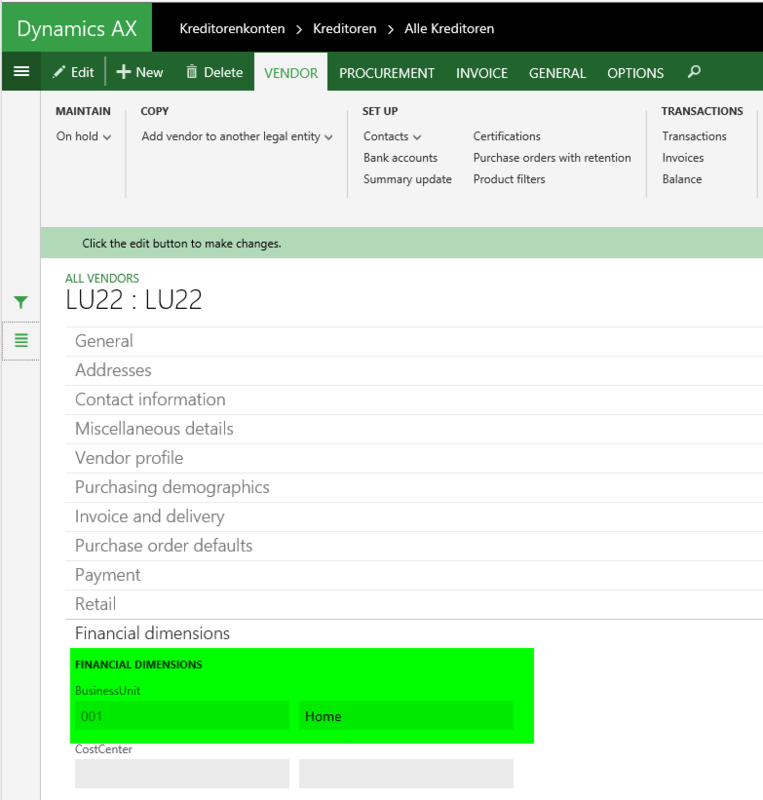 The first transaction recorded in Dynamics AX on 1 January 2015 is a vendor invoice for 1000 USD. At the time the vendor invoice is recorded the EUR/USD exchange rate stands at 80 EUR/100 USD, resulting in an amount equivalent to 800 EUR. 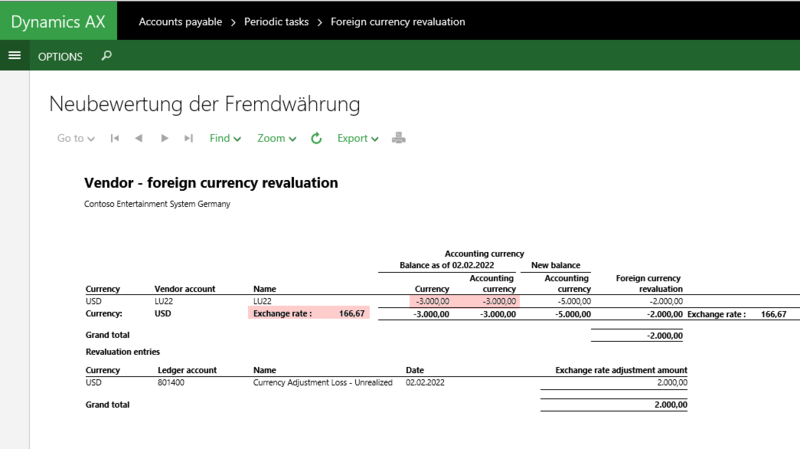 As the invoice is not settled until the end of January 2015, a foreign currency revaluation is run in the Accounts Payable module. This foreign currency revaluation process results in an unrealized exchange rate gain of 50 EUR (1000 USD * [80/100 EUR/USD – 75/100 EUR/USD]), which is recorded on the ledger account for unrealized exchange rate profits. The next screenshot shows the corresponding voucher. On 5 February 2015 the vendor invoice is paid by using a wire transfer. 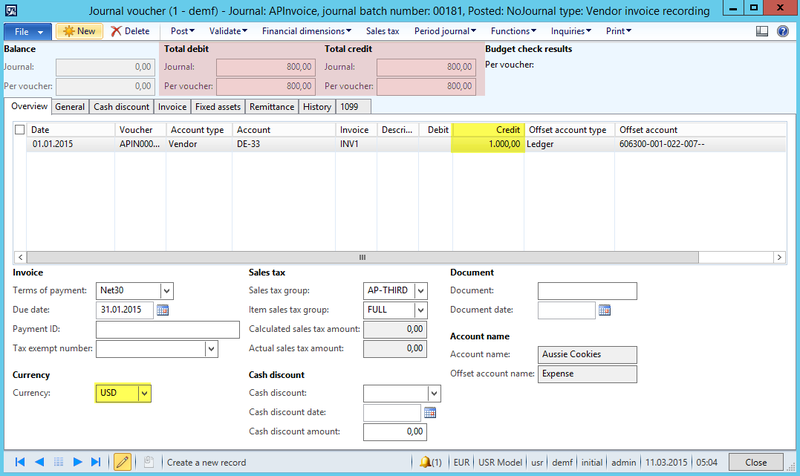 This transfer is – as usual – recorded in a vendor payment journal in the Accounts Payable module. Because the USD appreciated to 87 EUR/100 USD at the time the payment is made, an exchange rate loss of 70 EUR is realized. This loss is recorded on the ledger account for realized exchange rate losses. 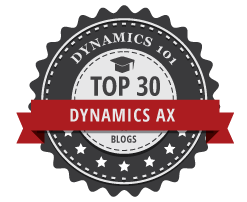 At the same time, Dynamics AX cancels the previously recorded unrealized exchange rate gain of 50 EUR. The next screens show the payment made and the corresponding vouchers created. Please note that the payment is made via a transfer account – in my example account “109053 Transfer Bank Charlie”. 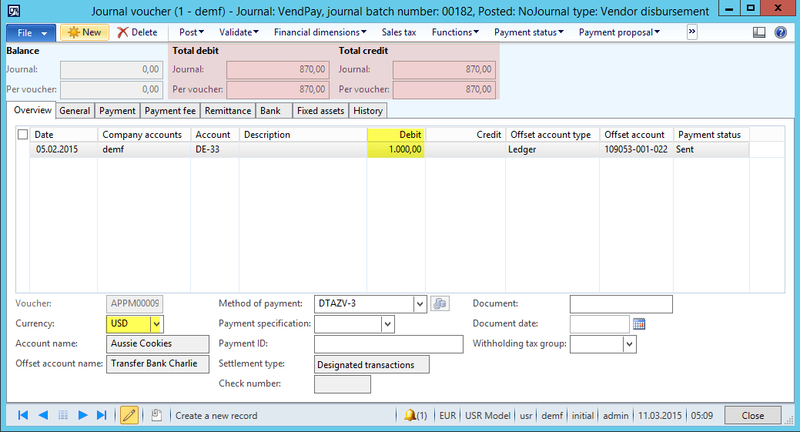 This transfer account is cleared on 8 February when the bank transaction is posted (see the next screenshot). As the EUR/USD exchange rate changed from 87 EUR/USD (at the time the payment was made) to 83 EUR/USD (at the time the bank transaction was posted), a balance of 40 EUR remains on the payment transfer account. 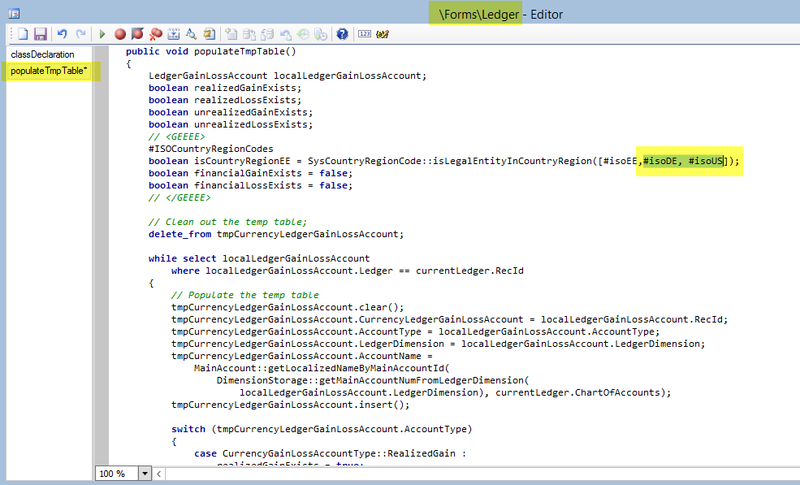 This balance can be identified in the following screenshot. 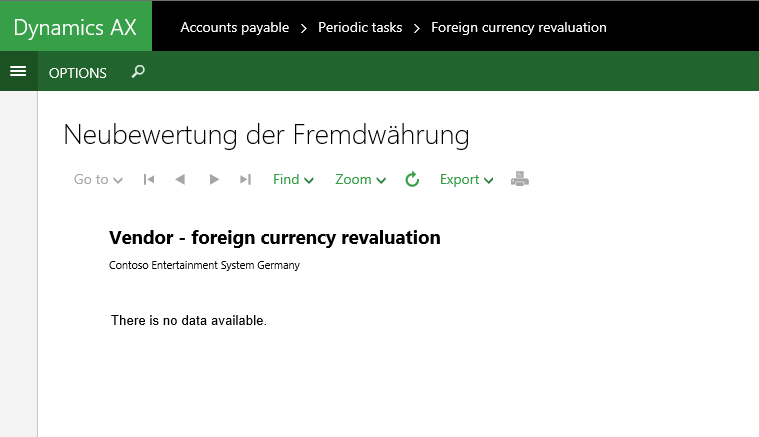 To clear this balance on the transfer account the foreign currency revaluation process is run in the General Ledger module for the respective account. The outcome of this revaluation process is a balance of 0 EUR on the transfer account. If one takes a close look at the foreign currency posting that is made to clear the balance on the transfer account, one can identify that the balance was posted on the ledger account that is used for recording unrealized exchange rate losses (see the next screenshot). Posting the remaining balance of 40 EUR against the unrealized exchange rate loss account is wrong because the transaction represents a realized loss. 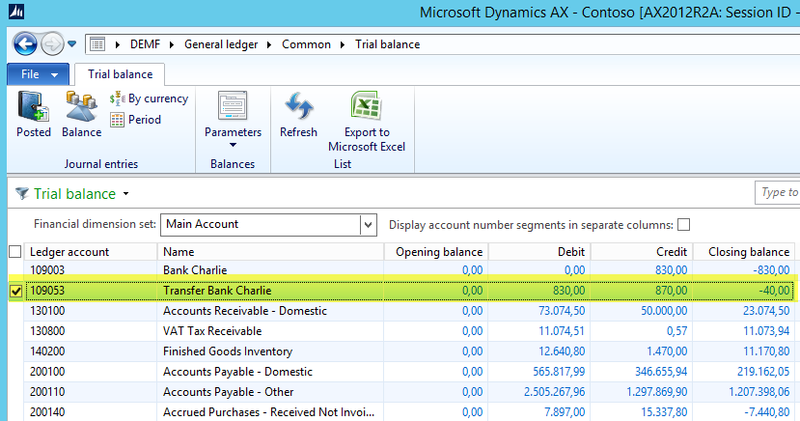 The next figure summarizes all transactions that have been recorded for this example and highlights the remaining realized and unrealized exchange rate gains and losses recorded in Dynamics AX. Even though the total exchange loss of 30 EUR is correct from an overall perspective, the elements that make up this total amount are wrong. That is, if your company reports realized and unrealized currency exchange gains/losses separately, your profit and loss statement shows incorrect figures. In this section I will show a possible solution to the problem illustrated. This solution requires some minor system modifications that are described next. 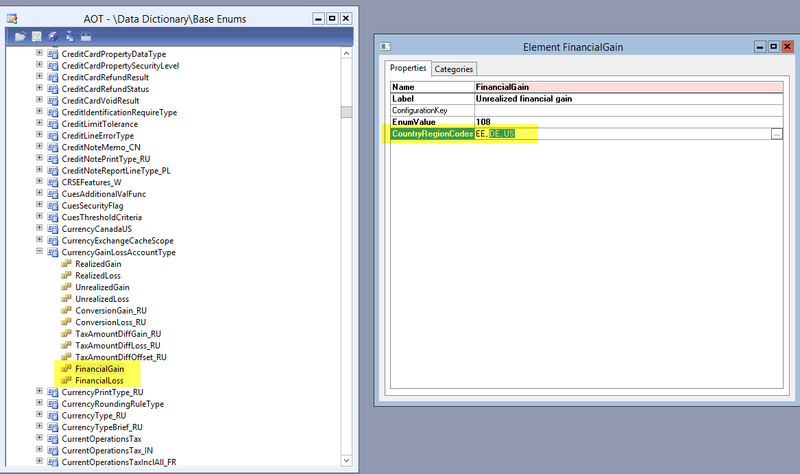 The first modification required is extending the Base Enum values “FinancialGain” and “FinancialLoss” of the “CurrencyGainLossAccountType” Base Enum. In my example I simply added the country codes for Germany (DE) and the USA (US). Please see the next screenshot for details. 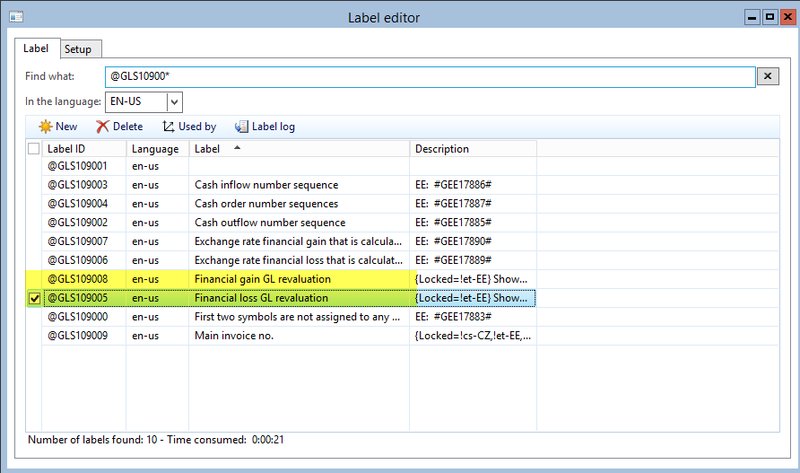 The next (optional) step is to change the following two labels: @GLS109008 and @GLS109005. 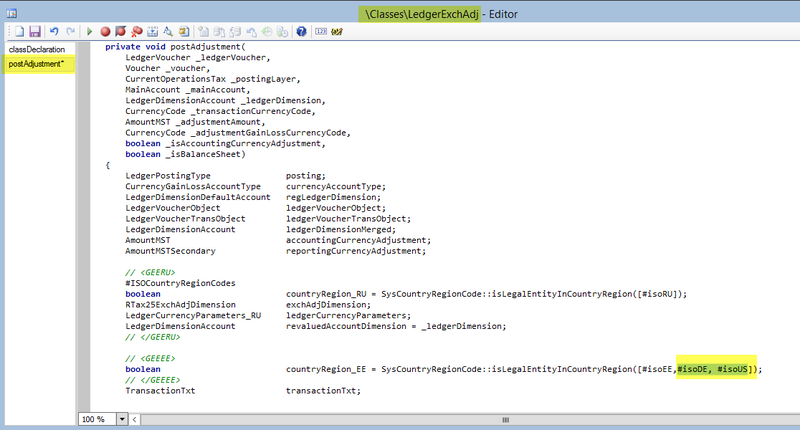 Step three requires extending the LedgerExchAdj class by the same country codes that have been used in step 1. Please note that those codes are entered slightly different (#isoDE, #isoUS). 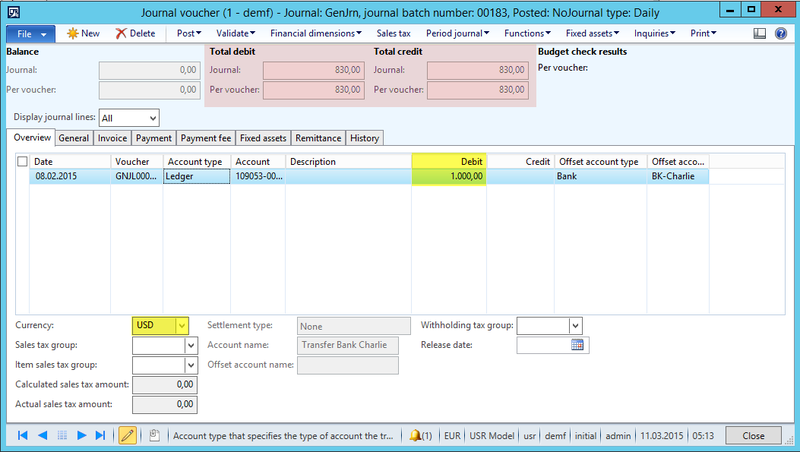 A similar adjustment is required in the ledger form as illustrated in the following screenshot. 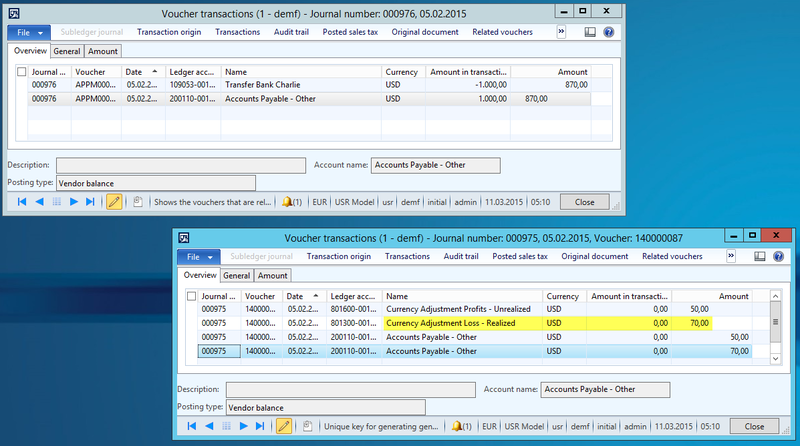 The result of those modifications is that two new exchange rate transaction types are available in the ledger form (see the next screenshot). With this setup I repeat the previously recorded transactions on another (“fresh”) bank account and its corresponding transfer account. 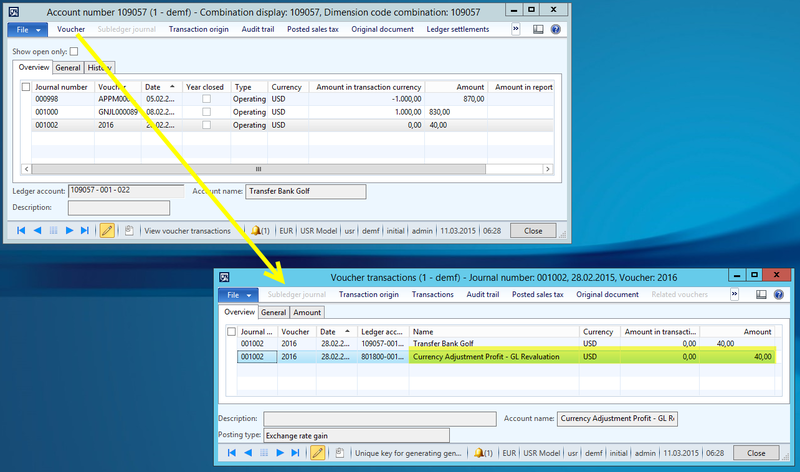 All steps and vouchers are identical except the voucher that is generated when running the foreign currency revaluation in GL for the transfer account. 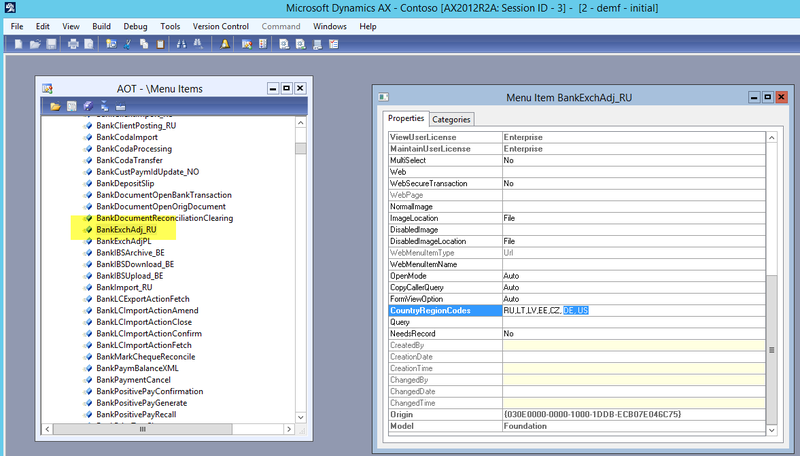 As you can identify from the next screenshot, after having done the previously described system modifications, Dynamics AX does now record the exchange rate adjustment of 40 EUR on the newly setup account that represents a realized exchange rate adjustment. 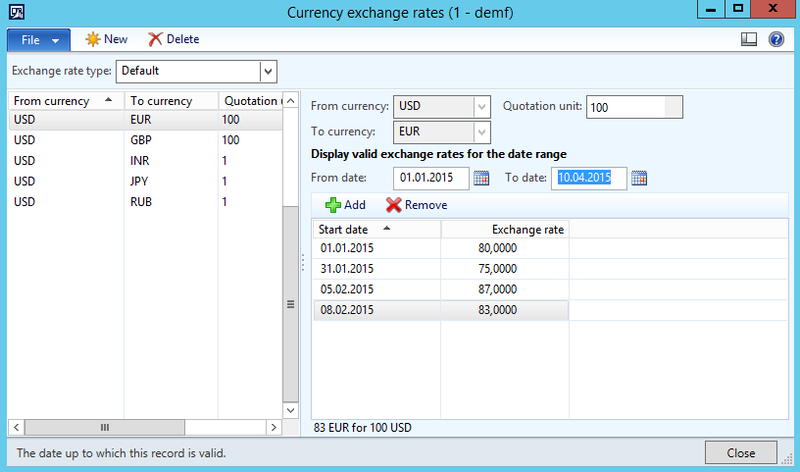 This change allows you reporting currency exchange rate differences correctly in your profit and loss statement. 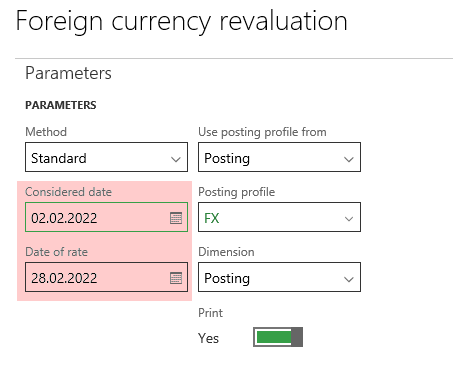 Please note that the foreign currency revaluation process in the Bank module is also affected by the changes described here. For details, please see my previous post.